Beacon Heights is a lovely 3rd floor unit with a spacious great room plan and luxurious leather furniture for your vacation enjoyment. You can’t beat the oceanfront views from the living room, dining room, and kitchen but don’t forget about the plasma TV for your viewing pleasure. The furnishings and atmosphere are tranquil and coastal with the river rock gas fireplace and the beach cottage style touches. If you are looking forward to a good night’s sleep the 2 comfortable King pillow-top beds and cozy bedding will not disappoint. 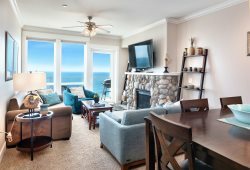 The owners of this luxury condominium have thought about your every need and have provided a sanctuary for a wonderful and stress-free vacation right on the beach in Lincoln City. Cook a great meal, relax in the comfy leather chairs, play games at the dining room table, and soak in the incredible oceanfront hot tub... Beacon Heights is the perfect vacation retreat for a group of friends or a family trip. They answered my questions promptly and were very helpful! Loved the covered parking garage and the elevator. Beautiful views of the ocean! Nice access to the beach!It was very nice and well lit.....felt very safe. The unit had everything you need for cooking. Couldnt believe how quiet the property was.....very comfortable stay. We will be back. Everyone has been professional, kind, and helpful. Very responsive to emails as well. I appreciated getting in on a buy 3 nights, get one free special as it made the coastal trip more affordable. The condos at Pacific Winds are nicely located, have outstanding views and I never worry about maintenance issues or having a quiet stay. The rules and protocol help everyone! We appreciate the ability to reserve online. It's perfect! Loved The view! The large windows. We loved the sheets in the Master Bedroom. They were very professional and proactive in dealing with issues at the property. The water pipe at the property site was leaking and they had to shut down the water. We rec'd a call from them to inform us about it and what time they were hoping to get it fixed. Amazing property, who can find anything truly wrong, you are right on the beach. I watched the sun set and the sun rise while sitting in the hot tub.